Passionate about tasty and natural food? Fond of having good food with your friends or family? People from around the world – from Colombia to Siberia, and from Myanmar to Guatemala – have shared with us their recipes as an invitation to participate in their culture and learn more about their struggle to maintain it. In this short book, you will read about wild garlic picked and used by the Shor people or the delicate cheese produced by pastoralists on the Dolomites in Italy. Each recipe has been shaped by generations of cooks and families to make it as tasty and special as it is now. Each recipe is deeply interconnected with its landscape, and the community who created it and who around that food has grown, discussed, cried, shared joy, told stories, dreamed, sung or danced. There is no way to separate good, tasty and natural food from the people that produced it and the land that nurtured it. This recipe book is a celebration of the importance of defending Indigenous and community land rights to protect our food and our future. We invite you try the recipes, learn more about the stories they tell us, and discover the profound connection between land rights and the food we eat. And join us in celebrating this connection during the World Food Day mobilization. You can organize a flash mob meal or a community dinner. If you are from an Indigenous or local community send us your favourite recipe and we will ask participants, chefs and influencers to share it. We are also inviting you to post pictures of yourself, your family or simply your plates of food as you seat down to meal and share it with the message: Land rights = Food rights. We demand #landrightsnow to protect our food! 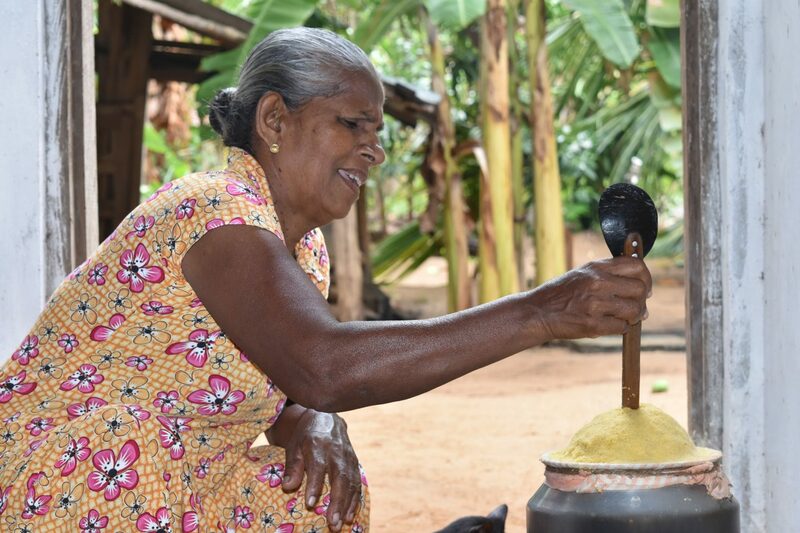 *In the picture, you can see B., a woman farmer from Sri Lanka, cooking a Pothy Pittu. Pittu is delicious form of steamed rice cake which is a meal on its own. The key ingredient of Pothu pittu is ripe corn kernels. Traditionally this dish was favoured among farmers and all ingredients are typically sourced from their own cultivations. 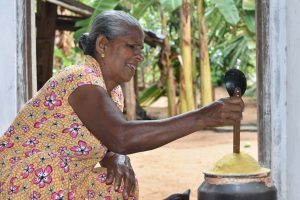 Removing the husk and selecting the most ripe corn is the secret behind cooking a good batch of Pothu Pittu. B. comes from Paanama, a village in the Eastern coast of Sri Lanka. Nearly 350 families of her community living in the five smaller villages have been forcefully evicted from their lands by the state to build a resort. Whilst a court has ruled in their favour in 2011, the decision still remains not implemented on the ground. The community asks the Government to act now and restore their rights.